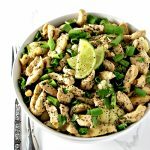 This Cilantro Lime Chicken is a delicious, tangy, gluten-free dinner recipe that is simple to make! It’s soy-free and paleo, too! I don’t know about you but I am always a sucker for anything cilantro and lime. They are two parts of an underrated flavor combo that deserve a spot right next to Fred and Ginger, peanut butter and chocolate, and football coaches and their clipboards. 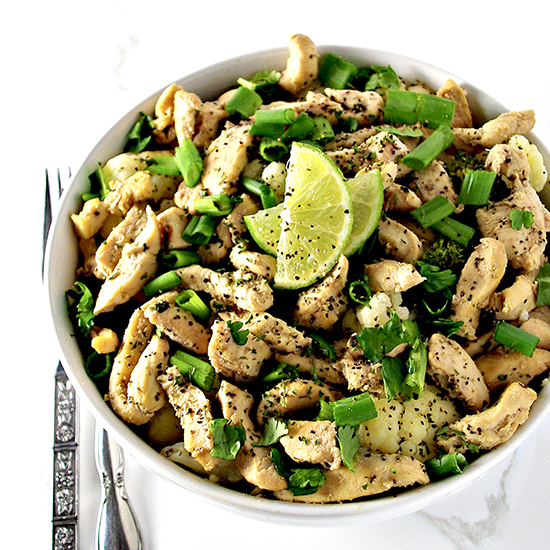 Cilantro Lime Chicken is yet another way to enjoy this succulent combo, and I’m here for it. I’m also here for the coconut aminos and fresh garlic that go along with these delicious flavors. You know who else is here for it? K-Hubs and the girls. Hand to God, the girls enjoyed the recipe. I honestly thought the lime and coconut aminos might be a bridge too far for them, but alas, I was mistaken. Everyone chowed down on this delicious paleo recipe, there were no leftovers, and I declared the meal a success. Here’s the thing. Chicken gets a little boring sometimes, and I don’t even think it’s chicken’s fault. It’s just what it is. The steady protein in our diet we’ve come to rely on. But sometimes, like any relationship, you gotta spice things up! And this time, we’re introducing chicken to all sorts of new ingredients. Coconut aminos give this recipe an earthy, yet sweet, flavor while still remaining a soy-free recipe. Lime gives it a little tanginess. And cilantro is just here to remind us this isn’t drive-through chicken. Nuh uh. This here is fancy chicken, but made in the comfort of your own kitchen and for way cheaper, too, I might add. Please note, from here on out, I will only eat fancy chicken. It has been declared, and I cannot be persuaded otherwise. Now, if you’re in the mood to change up your protein game at dinner time, then let’s get sautéing, and you, too, can be the proud creator of your very own fancy chicken dinner recipe. Also, you’re welcome. 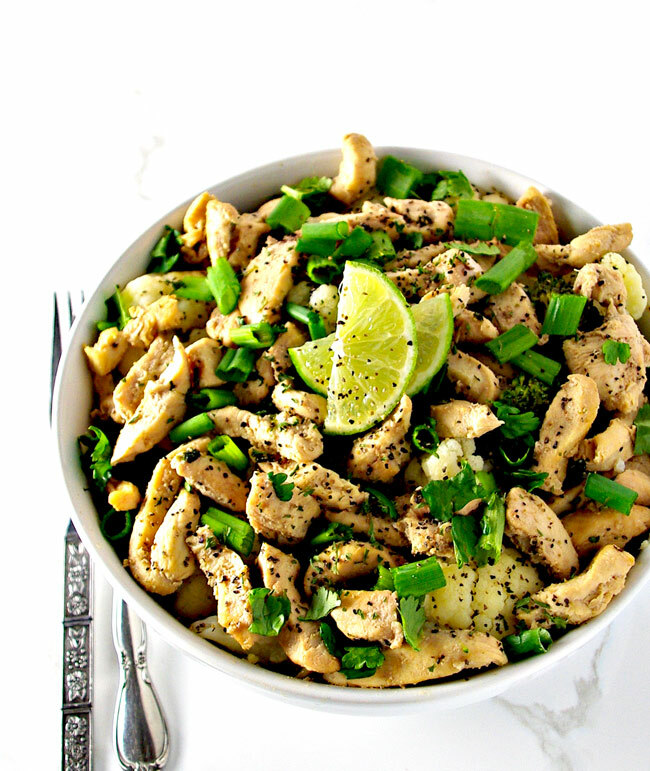 Below are the ingredients to make Cilantro Lime Chicken. You can’t go wrong with garlic. Also, take a few moments to decide just how you want your cilantro and green onions cooked (or not cooked, as it were). Keep reading for suggestions! Chicken breasts. Chop, slice, or cube the chicken breasts prior to marinating them. Lime juice and coconut aminos. These two are a surprising combo that I will be working with from here on out! They keep the chicken from being to predictable. Sea salt, garlic, and coconut oil. These ingredients just take the recipe up a notch, giving the chicken a rich, robust flavor. Cilantro and green onions. Definitely fresh is best here. And decide ahead of time whether you want your cilantro and green onions to be a little soft or crispy. If you want them soft, then let them cook with the chicken for about 30 seconds to a minute. Keep in mind, they’ll cook quickly, especially the cilantro, and will go from crispy to mushy in no time flat! If you want them crispy, then don’t cook them and add them as a topping instead (pictured). In a medium bowl, combine coconut aminos, lime juice, sea salt, and garlic. Add chicken and let marinade for about 2 hours. Melt coconut oil in a medium skillet, add the marinated chicken, and sauté, covered, for about 7-10 minutes or until chicken is cooked through. 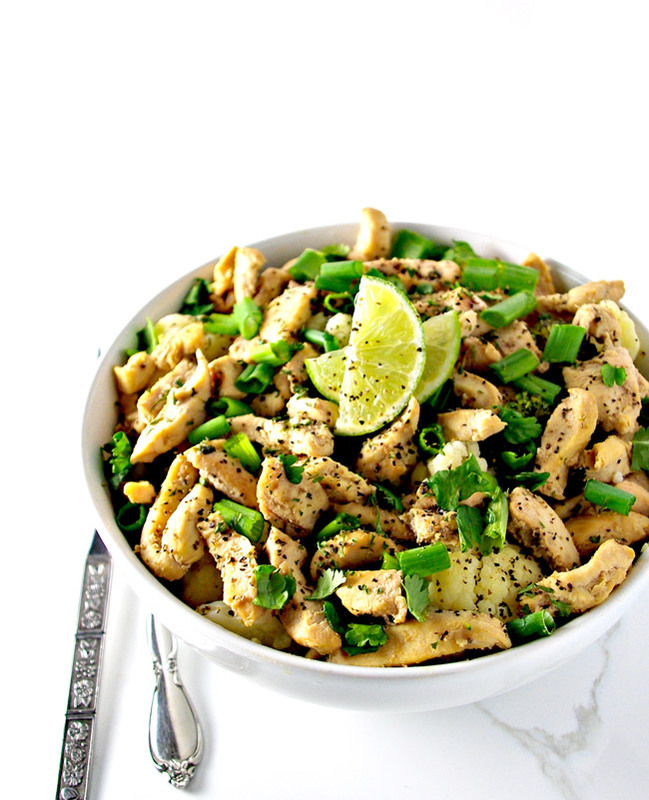 Stir in cilantro and green onions and enjoy! 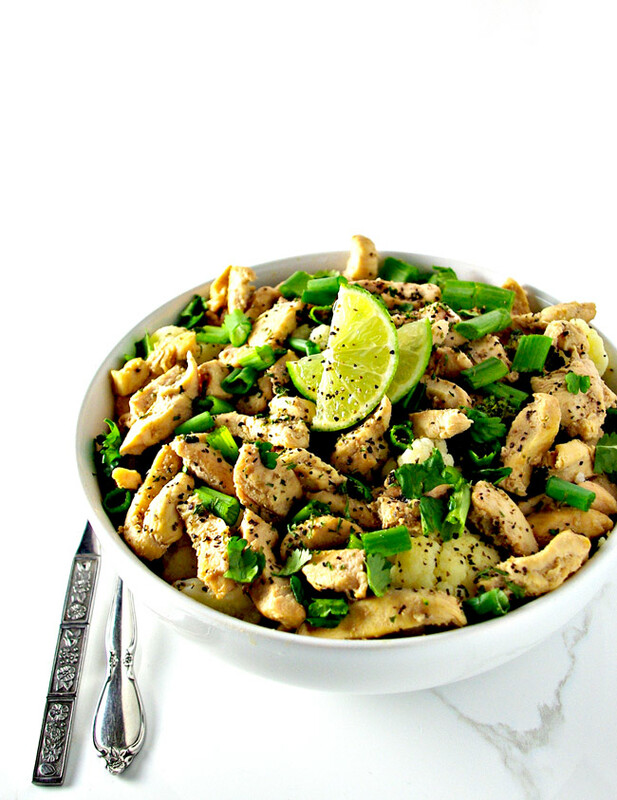 Serve your Cilantro Lime Chicken as is or with lettuce, mashed cauliflower potatoes (either regular mashed cauliflower or garlic mashed cauliflower), mixed vegetables, or cauliflower rice. In a medium bowl, combine coconut aminos, lime juice, garlic, and sea salt. Add chicken and let marinade for about 2 hours. 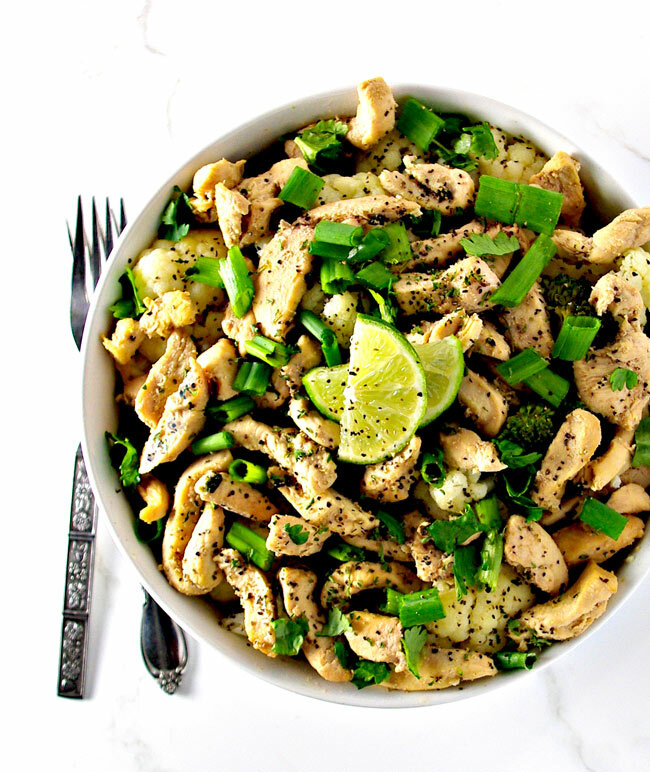 Serve your Cilantro Lime Chicken as is or with lettuce, mashed cauliflower potatoes, mixed vegetables, or cauliflower rice.